The human lungs are a pair of spongy, air-filled organs that are located on either side of the chest (thorax). The windpipe (trachea) passes inhaled air to the lungs through its tubular branches called bronchi. 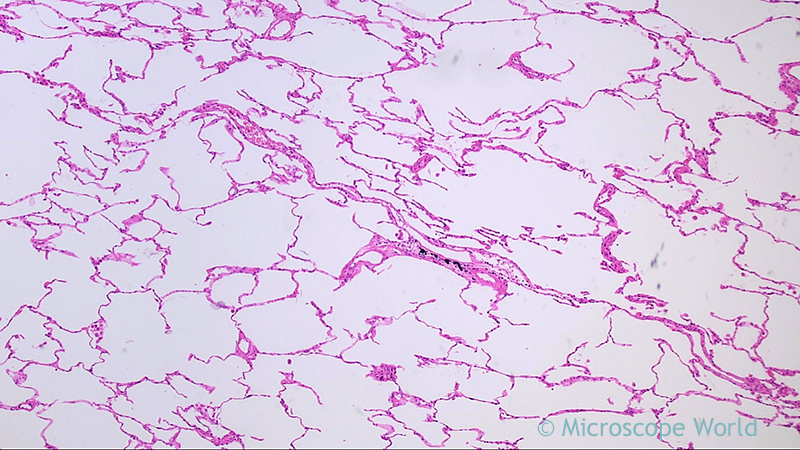 The bronchi then develop into smaller and smaller branches (bronchioles), until they finally become microscopic. 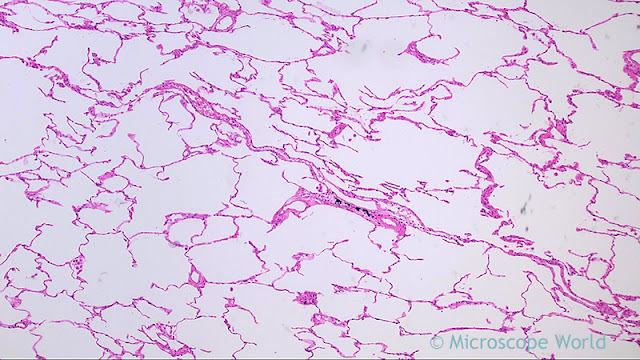 Human lung under the microscope at 40x magnification. 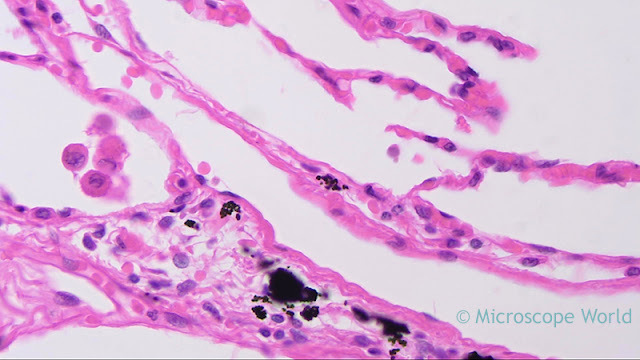 The bronchioles eventually end up in clusters of microscopic air sacs called alveoli. The alveoli are tiny sacs within the lungs that allow oxygen and carbon dioxide to move between the lungs and the bloodstream. Inside the alveoli, oxygen is absorbed into the bloodstream. Carbon dioxide, a waste product from metabolism, travels from the blood to the alveoili, where it can be exhaled. Between the alveoli there is a thin layer of cells called the interstitium, which contains blood vessels and cells that help support the alveoli. Human lung under the microscope at 100x magnification. The lungs are covered by a thin tissue layer called the pleura. This same kind of thin tissue covers the inside of the chest cavity, which is also known as pleura. A thin layer of fluid acts as a lubricant allowing the lungs to slip smoothly as they expand and contract with each breath. Human lung under the microscope at 400x magnification. The images shown here of human lungs were captured using the RB30 biological lab microscope and a high definition microscopy camera. Images were captured to an SD card and downloaded to the computer. 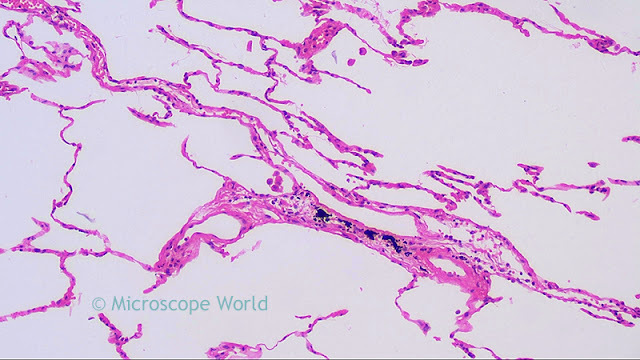 Human lung under the microscope at 40x magnification using a Plan Fluor Objective. Learn more about the human lungs here. 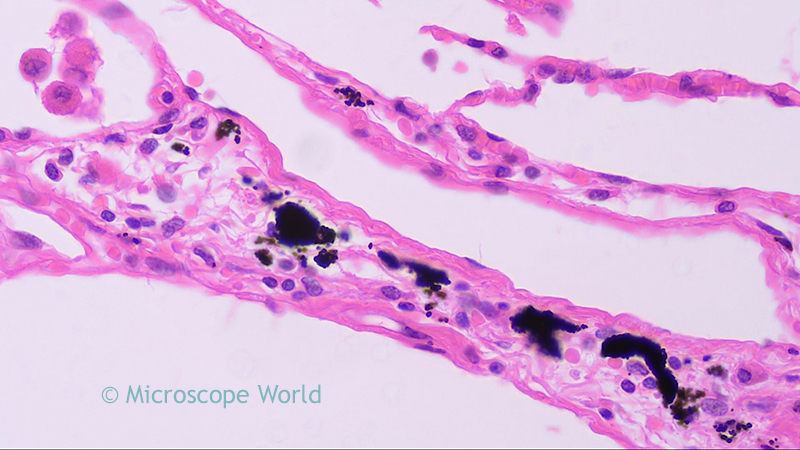 For microscopy related questions contact Microscope World.